,,In November we recommend the classic representative of the Pinot gris kind. Its harmonic juicy flavour goes well with mature cheeses and venison." Wines from our Chateau Pezinok collection are defined by their intensive flavours and heady velvet aromas. Here the craft of winemaking reached its peak, thanks to which this collection offers only a high-quality plethora of wines to choose from depending on the occasion or your preferences. Vitis Frizzante is a new collection from Vitis that offers sparkling wines. Bubbles in drinks are a current trend that lead to creation of these modern sparkling wines. Collection Vitis Frizzante creates a true Italian atmosphere, even while you are sitting at home in your garden or by the water. Monastery wines are one of the most well known collections of still wines. Their quality has a five decade long tradition and it presents a mastery in crossing varieties of cuvée. Wines of these varieties are on the daily menu in France, Italy, or Spain for their captivating spicy taste. True young wines can be find in November, when all vintners start with traditional wine celebrations. Young wines are characterised by vitality and energy in every sip. Their beauty comes from and extravagant aroma and fresh fruity taste. A bottle of this sparkling wine can almost magically satisfy everyone. It will speak to you with its strong nutmeg aroma that is in perfect harmony with mead and almond taste and adequate level of acidity. Wines from this collection are the result of traditional wine production under Carpathians. Traditional wines from Vitis Pezinok have become very popular and sought after in Slovakia. Pick from our selection of five white and red wine and find your favourite. Quality wines from Vitis Gallery collection are one of our most popular wines. Their uniqueness is in their playful, scintillating taste, but also in their art labels. Thanks to their new design inspired by pop-art, you will always find your Vitis in the gallery of wines - your way to wine. Let yourself be carried away by the harmonious flavours and scents of wines from Vitis Symphony collection, whose production was inspired by the intricacies of music. The art of their production is also hidden in the careful selection of grapes with the help of modern technologies and years of experience. Let yourself be carried away by the harmony of tastes and fill your day with music. The collection of Château wines will please fans of white and red medium sweet or even dry wines. Simply high quality table wines that will enrich any occasion spent with family or friends. Archiving wines is one of the many ways of getting an opportunity to taste past. After years of aging Vitis offers you eight select still wines from our archive, whose history started in the second half of the last century. Some of these wines are typical for Lesser Carpathians area - a true treasure chest of wine production in Slovakia. 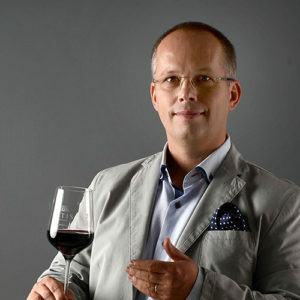 My name is Juraj Kordiar and I am a Vitis Pezinok sommelier. Let me know what occasion is ahead of you and I will help you pick the right wine.